A study has concluded that $136 billion in U.S. currency — 88 percent of the total circulation—is missing. That is, however, only 12 percent of the $153.9 billion of cash supposedly in circuiatAon. Where is the rest? The study, published in this month' s Federal Reserve Bulletin, has important implications for the central bank in its efforts to control growth of the nation' s money supply. The basic measure of money known as M1, is defined as currency in circulation and checking accounts. 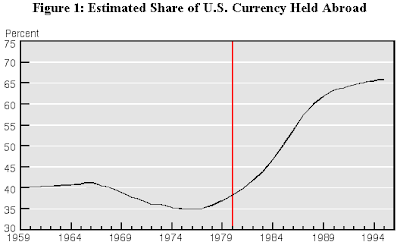 The $153.9 billion estimate for the amount of currency in circulation accounts for about one-fourth of the M-1 total. If it turns out that a great deal of this money is no longer in the United States, the growth targets the Fed sets for M-1 would have to be adjusted. The study concluded that the amount of currency in circulation, the $18 billion held by Individuals, is changing hands more rapidly than had been estimated. The study estimated this money was spent and replenished at a rate of about $420 per adult a month. This turnover of money is known as velocity. In recent years it has failed to perform as policymakers had expected, blunting the effect of Fed efforts to manage money growth. The study said 14 percent of American families operate on a cash-only basis but most family finances are handled through checking accounts which covered 57 per cent of all family spending. The study said 42 percent of families have cards for automated bank teller machines but only 30 percent of families used the cards in the month before the survey. The survey on financial patterns among U.S. families was conducted for the Fed from May to August 1984 by the Survey Research Center of the University of Michigan. which Interviewed 1,946 families. “We need to take a more careful look at how money is being used in the economy,” Spindt said. He said the authors of the report are recommending that the survey of cash be repeated on a regular basis to get a more accurate reading of peoples use of money. 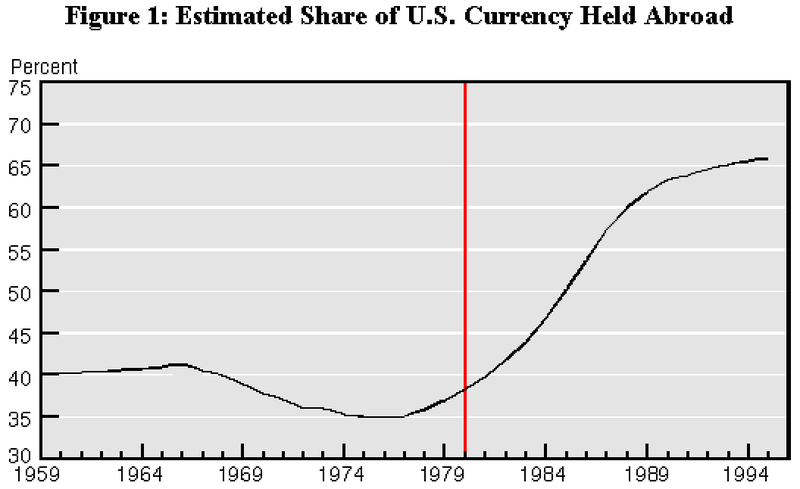 Confidence in the dollar was collapsing going into the 1980s (see some of my other entries), so why was the share of dollars held abroad increasing? Where is the majar article bro?? World Cup final has long gone..
where's the dude who kept stating gold, dollar up? at this vantage, i don't see dollar rally any more. gold yes. dollar dead. could be wrong in this manipulated market but i don't see how it can be done at this point. When are you going to write about the drought in Russia? Wheat prices up apparently.